Who is the Breeder ? Ki a tenyésztő ?! / Who is the Breeder ?! Casanova the 6. generation Sáregresi won Baby Best in Show in Pécs International Dog Show. Casanova a 6. generació Sáregresi Baby Best in Show lett Pécsett a Nemzetközi Kiállításon. 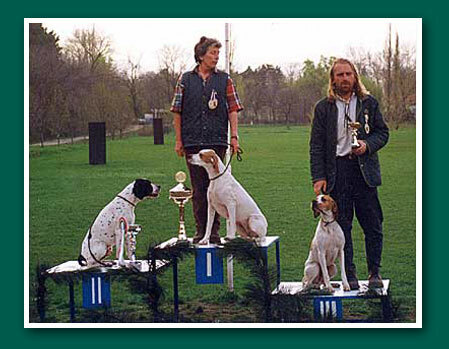 A breeder should be the fairest judge of the real qualities of his/her dogs, - should never be “blinkered“ in their favour. Hard decisions have to be made when choosing the candidates for breeding. This process, needless to say, should never involve cruelty by killing the dogs deemed not worthy of breeding from. Those animals have to be given a good life – while the breeder also has to make sure these dogs will not be used for future breeding. A breeder qualifies to be called “ breeder “ after the first litter has been produced, provided all the guidelines were strictly adhered to. The fact is, however, that at least 3-4 litters are necessary to gain enough knowledge and experience – to see the results of all the careful work and personal achievement. Knowledge can be attained, experience can be gained, while “ breeder instinct “ is a highly individual quality that can not be learned - a BREEDER has to be born with it. 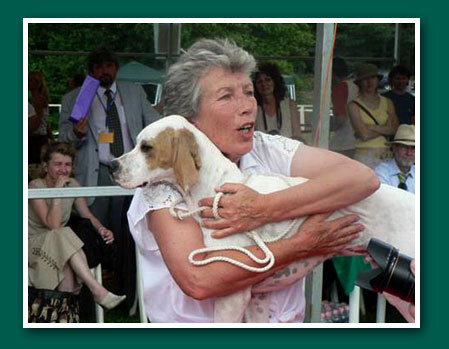 Dual CH Sáregresi Passionate Polly won CACIT on International Field Trial. On the second place with res CACIT his sire Dual Champion Saregresi Onset. Dual CH Sáregresi Passionate Polly CACIT címet nyert egy Nemzetközi Field Trialon. A második helyezett res CACIT az apja, Dual CH Sáregresi Onset.